Roasted Romanesco Cauliflower | Life's Conundrum - Eat to Live or Live to Eat? Have you ever gone grocery shopping and come across a vegetable for the first time and wondered how you have missed it all these years. 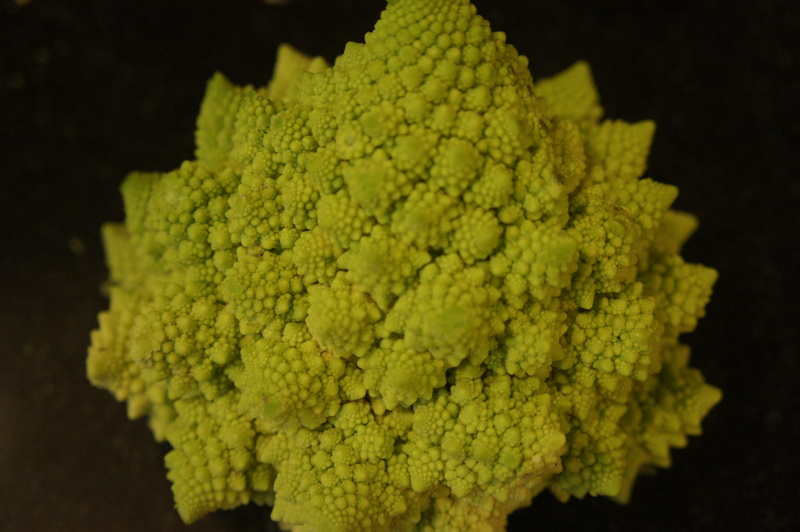 The Romanesco cauliflower certainly falls into this category. The vegetable was visually striking, a vibrant light green (almost fluorescent) when we first came across it in a farmer’s market a few months ago and regretted not picking it up (we were out and about and didn’t want to carry it around). Then again on one of our trips to TESCO this marvel of nature turned up and we bought it and cooked it in a cheesy bake. In hindsight, we did not do this vegetable justice by masking it’s wonderful nutty flavour in a cheese sauce. Last night we decided to make amends and scoured the web for an authentic Italian recipe using this vegetable as we figured the country where it was discovered and originates from probably treated it with more care. Sure enough there are a few recipes using it in a risotto or pasta dish. 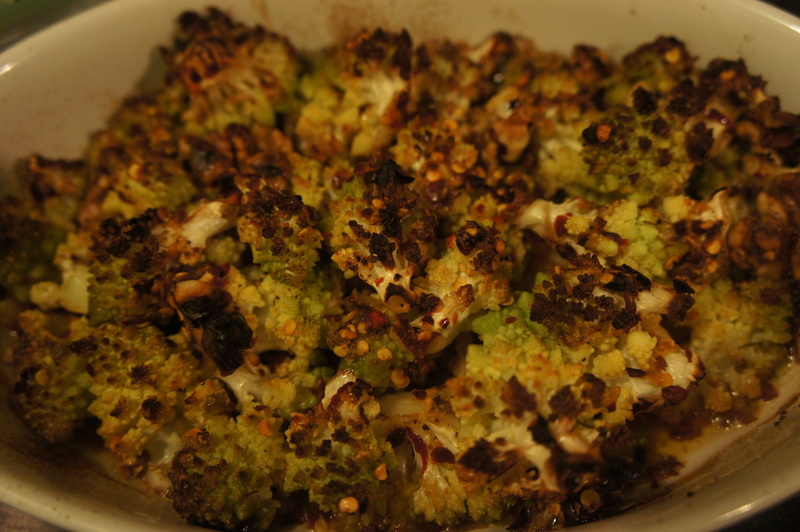 There were quite a few recipes which were simple and essentially called for roasting the cauliflower in the oven with the fewest of ingredients. We’ve replaced pine nuts with walnuts and it seems to work to provide the dish with some crunch and texture and added some walnut oil to accentuate the taste of the walnuts. Mix all the ingredients in a large bowl and the transfer onto an oven proof baking dish or tray. Cook in pre-heated oven at 200 degree Centigrade for 20-30 minutes till the cauliflower begins to lightly char. Serve hot. 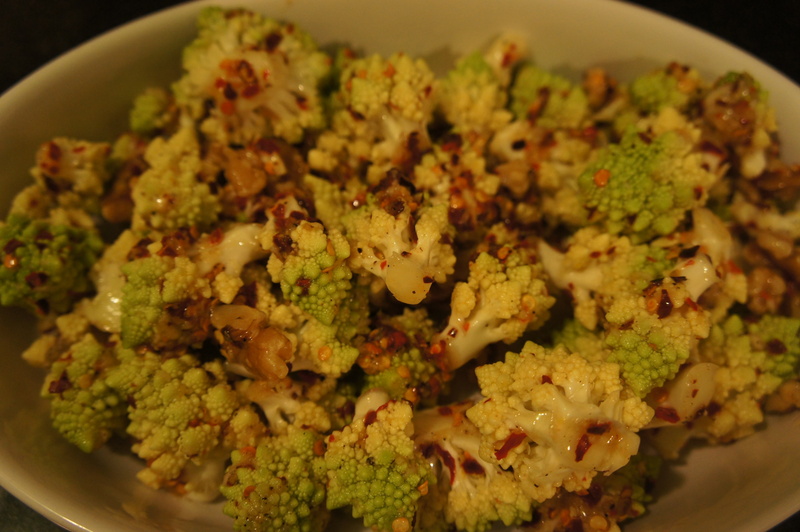 Posted on January 28, 2014 by Anna and Shiv	• This entry was posted in Recipes, Side Dishes and tagged chilli flakes, italian, romanesco cauliflower, romanesque, side dish. Bookmark the permalink.